You are cordially invited to join Boom Boom L’Roux, Ruby Mimosa, Lady Drew Blood, and Amara Strutt for an evening of beer and burlesque at Brouwer’s Cafe on January 31st. 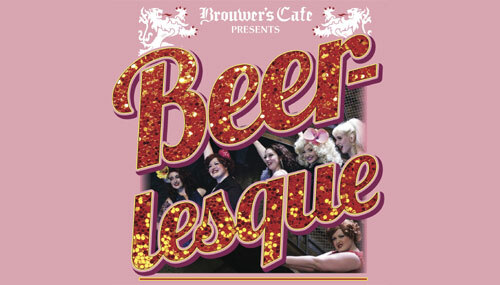 This year’s event is an encore to last year’s magnificently successful BEERlesque show. The event will be emceed by Sailor St. Claire. BEERlesque is a ticketed event with all proceeds benefiting Old Dog Haven, a local dog rescue organization committed to helping old dogs find forever homes. Tickets are $30 and include a beer from one of the partner breweries – Ayinger, Brasserie du Bocq, Dupont, Lindeman’s, and Weihenstephan. Doors will open at 7:00 and the show begins at 9:00. This will allow attendees to order and enjoy dinner beforehand. Dinner service will end when the show begins. Secure your tickets now for this show, which is certain to sell out.